WordPress is an amazing CMS and we can accomplish almost anything with great WordPress plugins and widgets. Social Media and online social sharing is the lifeblood for many businesses and marketers. I turned to WordPress and try some event management widgets for the project. Here, in this article, I would like to show you a gallery of useful free WordPress Facebook event widget plugins that you can use on your website. Though there are number of options, we have tried our best to compile only the top quality options for you. If you like this post, share it with your friends through email and social networks. If you like this effort then don’t forget to take a look on other articles: Free Knowledge Base Plugins for WordPress, Free Recent Comments Widgets for WordPress, Premium Lifestyle WordPress Themes and Best Free Blackletter Fonts. Contests by Rewards Fuel lets you run contests that will help you earn newsletter subscribers, Instagram & Twitter Followers, blog comments, Retweets, Facebook Likes, and more. Use this plugin to create and display contests right from your WordPress website. Create Social Feeds of any or all your celebrities, family, friends, yourself, or businesses. Looks great on Desktops, Tablets, and Mobile Devices. If you’re looking for more than just a custom facebook feed our plugin includes most of your favorite social networks. View photos and videos from your Facebook Page, Group, Album Photos, Album Covers or Event in our FREE version. Facebook like box plugin to display Facebook page live stream & friends on WordPress blog. Using Facebook Like Box Plugin Facebook widget publish your Facebook page post & show your Facebook page fans. Using [FBW] shortcode you can publish your facbook like page on any Page or Post. The Facebook Feed Plugin allows you to easily display a Customization and Responsive feed of your Facebook Page on wordpress website. Easily add Facebook Feed using the shortcode [facebook-feed], Display all Post Types, Display Events from Facebook Feed. Display a completely customizable, responsive and search engine crawlable version of your Facebook feed on your website. Completely match the look and feel of the site with tons of customization options! By default the Facebook feed will adopt the style of your website, but can be completely customized to look however you like – with tons of styling and customization options! Embed any public facebook video, page, post, profile, photo or event directly into a WordPress post, without having to write a single line of code. Simply put the facebook url on a separate line on the content of any post, and this plugin will fetch data associated with that url and display it. 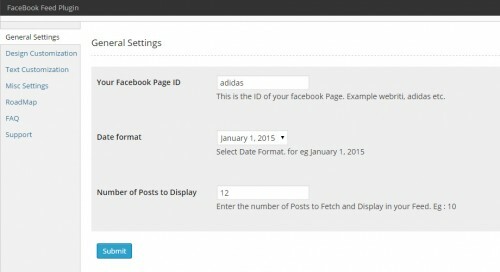 Easy Facebook Post Feed, allow users to display a customization and responsive Facebook feed. It’s quickly to use by widget or shortcode anyway. Customize layout option like: color, border, number of post to display, choose to display image, width and height. Work with Facebook API it’s simple to set up: just enter your page id and Facebook API.